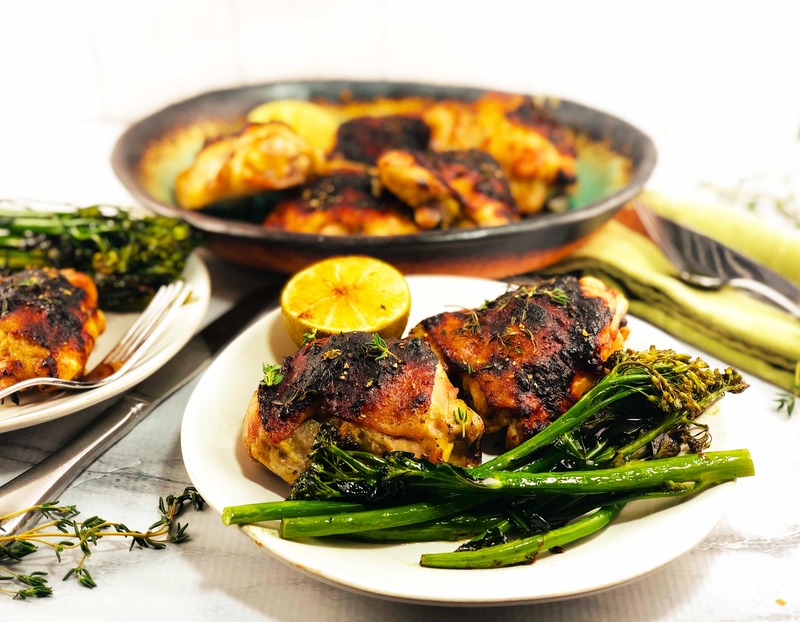 Sheet Pan Rhubarb Chicken with Broccolini is a mouthful of Springtime! Easy enough for a weeknight, impressive enough for guests! Rhubarb and I go way back. When I first saw it in our home garden in Indiana, I was pretty sure it was some trick to get us to eat more celery, albeit prettier celery. Then, when my Mom put it in a pie, I had to wonder. Should I taste this celery pie? I do like pie. However, this was the same Mom that made a savory pot pie she called “Kidney Pie”, which my Dad could not have loved more. But me and my sibs, not so much. So, … there’s that. When I moved to the Pacific Northwest, I was thrilled to find rhubarb in the grocery and promptly made a crisp. But the taste was … different. It was (disappointingly) milder. Huh! What’s up with that? Turns out, not surprisingly (! ), different varieties of rhubarb just taste different. So take a look at the Rhubarb Compendium. Because, thank goodness, there IS a Rhubarb Compendium. You’ll see there are many varieties, each with its own size, coloring, and flavor profile. So, now, I actually give the rhubarb a bit of a “smell test” to see if it has the aroma of the tart, tangy, and fresh flavor that I recall from my childhood. Maybe it’s just me, but I also feel like the later-harvested (June-July) varieties have a bit more flavor. 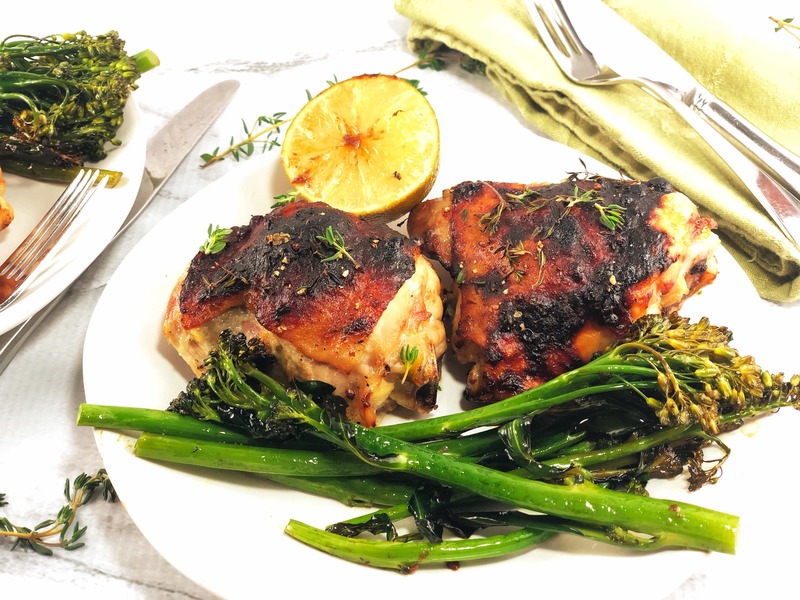 But I can guarantee, this Sheet Pan Rhubarb Chicken with Broccolini is not lacking in any flavor at all! Rhubarb gives it a “punch” so pleasant, you’ll want it again and again! The recipe, like most Sheet Pan dinners, is pretty easy. First, you’ll need to make a “Rhubarb Butter” by simmering together some chopped rhubarb, honey and orange juice. Then, you strain the rhubarb, and mix that with some butter, but save the juice, because that will be used to baste the chicken thighs. Rub the butter between the skin and the flesh of the chicken. Baste them with olive oil and reserved liquid, and pop into the oven for 30 minutes. Partway through the bake, drop some veggies onto the pan, and 15 minutes later, one of the most flavorful dinners ever is ready! Lastly, thanks to Ron, who writes a lovely blog on Scandinavian traditions and foods, for reminding me of Rhubarb chicken, which I made several years ago, and realized I’d been missing that flavor! So, if you love sheet pan dinners, why not try this Curried Chicken with Cauliflower and Grapes or my Greek Chicken and Vegetables? Also, take a look at my other Rhubarb Recipes! Rhubarb has long been one of my favorites too. My parents used to grow it in their garden and I looked forward to eating it every summer. So good! And I love the idea of using it in a savory preparation–this sounds delicious! It’s interesting how many of us grew up with rhubarb in our gardens, isn’t it? Thanks, Kelsie! We grow rhubarb in the summer months and this would be such a yummy idea for it! Never thought to pair it with chicken like that before! And who doesn’t love sheet pan dinners? They’re a staple in our home 🙂 Delish, my friend! Thanks, Dawn! I hope you get the chance to try a savory dish with rhubarb,it’s a great flavor to add! Thanks for your visit! I haven’t thought of using rhubarb with chicken before, it sounds like such a great combination! It is a great flavor to add to savory dishes, Caroline! Hope you get the chance to try it! It is my first time to hear Rhubarb, and the after researching found out that this vegetable is very healthy. Love the combinations of the flavors. Hah, I’ve never had kidney pie, and I’m not sure that I’d be a big fan…but rhubarb? Rhubarb I’m into! I’ve never thought to include it in a savory dish like this. Great idea Laura! As soon as my rhubarb is ready, I”m making this! Thanks, Katherine! You and I are totally on the same page with the kidney pie and the rhubarb! 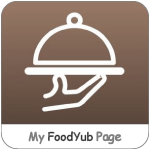 It’s awesome for savory dishes, and I’m hoping to get the chance too try a few more! Thanks for visiting! Brilliant idea, and wish I’d had this for my rhubarb round up last week, the idea of using rhubarb in savory dishes is genius! Thanks, Sue! Yes, rhubarb is wonderful in savory dishes! I plan to use it more often myself this way! Thanks so much for visiting! What a delicious flavor combination! I’m still trying to get my hands on some rhubarb! Excited to try this. Thanks, Mary Ann! Hope you love it as much as we do! Thanks for your visit! I had no idea there were so many different varieties of rhubarb! I just spent ages looking at the Rhubarb Compendium link trying to work out which ones I had tasted from all the people I know here in Scotland who grow and cook with it. I’ve never had rhubarb chicken before and it does look delicious. As soon as I get my next batch of rhubarb I hope to try this. Thanks for this recipe inspiration Laura! Thanks, Neil! I, too, am surprised how many varieties, but it makes me feel better to know, as I find some a bit bland. I love the stronger-tasting rhubarb, we just don’t get it often here. Hope you get the chance to make this chicken, I can’t wait to make it again! Hi Laura, a lovely way to enjoy a classy meal with little fuss and clean-up. As you know we love savory rhubarb dishes over this way, but I’ve not had one quite like your sheet pan chicken. That rhubarb butter sounds wonderful and I can see it on more than chicken. Our rhubarb is just showing the top of their green leaves, but when they are ready for harvest, you’ve given us another great rhubarb recipe to try. Thanks for sharing and thank’s for the mention. Thanks, Ron! I’ve made a whole roasted rhubarb chicken before, just wanted to adapt it to a weeknight meal. And, like you, I love a nice savory rhubarb dish. I had a bit of rhubarb butter leftover and mixed it in with the Broccolini when it was done – so good! Thanks for visiting! What a fun recipe! I’ve never heard of rhubarb chicken, but I’m all in on this one. (Ron really does post some great stuff, doesn’t he?) So calling something Kidney Pie is pretty much a sure-fire way to make me eat a peanut butter sandwich for dinner. haha! I typically think of rhubarb in a dessert recipe, so I’m intrigued by using it here in a savory recipe. Thanks for sharing, Laura! Haha, David! I totally agree, you shouldn’t name anything “Kidney Pie!” And, yes, you really should try rhubarb in a savory dish! I imagine it would compliment any meat, really. Hope you get the chance to give it a try. And thanks so much for your visit! I’ve not seen rhubarb in our market yet…I don’t think it is very popular here in our part of Florida. If I do see it, this sounds like the perfect way to use some of it. I sounds great. Thanks, Karen! I understand it grows best in climates a bit north of Florida! But it’s definitely worth a purchase if you see it! Thanks for visiting! You are opening a whole new territory for me ! We cook with rhubarb but I have never made or tasted anything savoury combined with it… Pinning dear ! Thanks so much! Hope you love it like we do! 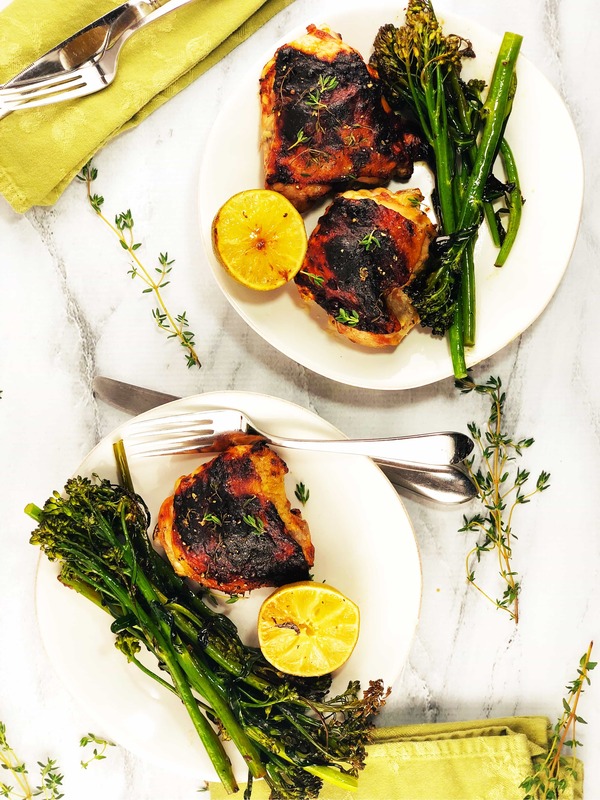 Way back when my blog was a baby blog, I roasted a whole chicken this way! Just as good, but takes a bit longer.